Occupational Safety and Health Network (OSHNet) – 10, Inc. has recently conducted training for nurses, safety officers and construction personnel. The training was a learning session on “First Aid in the workplace”; it was held on February 3, 2016 at Polymedic Medical Plaza. Homechoice Planners and Construction Corporation took part in the said training by sending their company nurse and safety officers to attend in the activity. Topics such as Roles and Responsibilities of the First Aid Provider, Medical Emergencies, Injury Emergencies, Head, Neck and Spine Injury, Burns and Electrical Injuries were discussed. The attendees were also taught different first aid treatments for stroke and abovementioned injuries. Skills such as proper removal of contaminated gloves were taught as well. Thanks to the speaker – Mr. Jarolito I. Ruiz, Assistant Director of Nursing – Training and Development of Bellevue Hospital Center, New York, USA; for imparting his knowledge and skills. The attendees actively participated in the three hour training; all were willing to learn and know the different first aid treatments, skills and procedures. 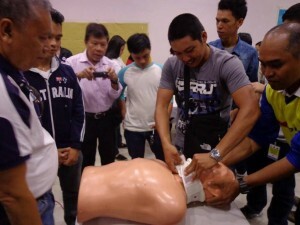 There were segments prepared for the different first aid procedures where the participants are free to perform a return demonstration of the procedures learned. 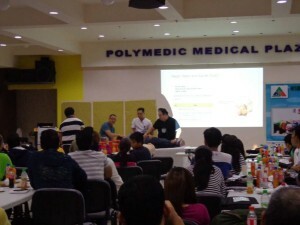 Thanks to the staff nurses of Polymedic Medical Plaza for patiently demonstrating the first aid procedures. This training is a vital learning to all the participants; their knowledge and skills will not only be limited to their workplace but also can be used in their households or in any place. Such any accidents will occur, immediate first aid treatment can intervene further cause of the problem or even death. Looking forward for more meaningful trainings and seminars of OSHNET-10! Cheers to the successful activity! We are fully aware how important health is; how vital it is to have a healthy mind and body. A healthy person can think and function well, thus, this makes them productive throughout the day. Nowadays, being physically fit and healthy is a must when it comes to work or even finding a job. In every company that you apply or work in, they now require medical examination to see that you are fit for the job. It’s not only the credentials that they see but your health as well. Of course, they wanted to make sure that the certain person they have given the job is not only a responsible one but a healthy being as well. Every company requires these medical examinations to their workers to ensure clients that they have a healthy environment. Knowing that these days, a lot of contagious disease are spreading out, being health conscious is just important. Of course, the company wouldn’t want to be the reason of spreading contagious diseases. For a company to be strong, the workers should be strong as well. The said medical examination took place last February 11, 2013 in the company’s warehouse. Supposedly, the tests was scheduled to do in the morning only but due to the workers’ overwhelming number it turned out to be a whole day activity. We were glad to see that the workers obligingly took all the exams including Drug test, CBC test and Xray exam. It was a successful activity and we thank the workers for their cooperation. And this medical examination is not the only health advocacy activity that we will be having. Expect more health related activities to come. Until then! October 6, 2012 – another remarkable day for HomeChoice Planners and Construction Corporation as they had conducted their very first blood drive. 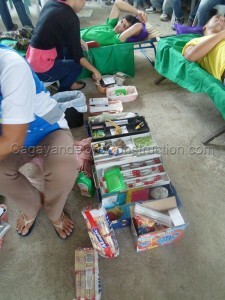 In partnership with the Philippine Red Cross CDO Chapter, the bloodletting activity turned out to be a success. 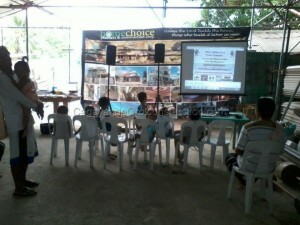 The eventful day happened at the HomeChoice Planners’ warehouse and was joined by staffs and workers of the company. We are overwhelmed with the number of workers who decided to donate their own blood in place of saving other people’s lives. It is the company’s very first blood drive and we are so glad with the twenty one workers who willingly donated blood. Blood, as we all know, plays a vital role in our body. It is important because it serves as a tool for us humans to be able to function well. The presence of blood in one’s system is essential because of the functions that it plays in the human body. It is responsible in the maintenance of our body temperature; protects us against foreign substances and in the clot formation as well. Our blood also helps us in the transport of nutrients, gases and waste products. Donating blood is a way of alleviating human suffering. 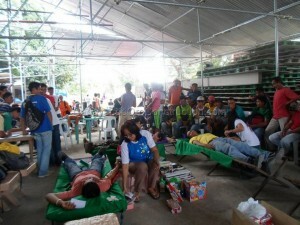 This activity is conducted as many people are in need of blood and suffering from different conditions. That’s why we at HomeChoice Planners decided to be part of this activity because we wanted to be an advocate in alleviating human suffering; that in our own little way, we could act as heroes in saving people’s lives. To the Philippine Red Cross CDO Chapter, thank you for collaborating with us in making this activity possible. 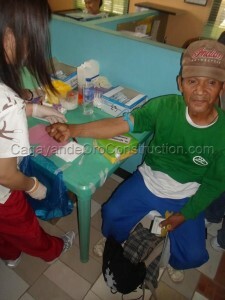 Thank you also to our staffs and construction workers who became donors of the said blood drive. With the successful outcome, expect that we will make this bloodletting program an annual activity in our company. Let us continue in saving more lives. Let’s donate blood. Nutrition is an essential aspect that we humans should be concerned of. It is very important for everyone because nutrition is the nourishment that our body needs. Having the right nutrition means being able to work and perform well with our activities of daily living. Knowing what benefits it would give us for having the right nutrition, this is important most especially to the children. It is linked to the aspects of their growth and development that is responsible for the factors directed to their health as adults. As part of the health monitoring program that HomeChoice Planners has implemented upon the workers, the company then came up to another program that is of help to the workers’ children. 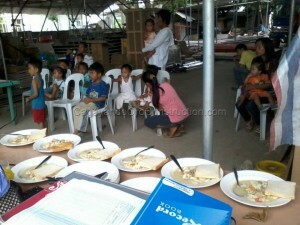 Last Saturday, September 22, 2012, a feeding program was conducted at the company’s warehouse. The feeding program started around 3:00 in the afternoon and it was attended by the HomeChoice Planners workers’ sons and daughters. The program was headed by our company nurse, Ms. Lenny Tamo-o, wherein she prepared some games, educational videos and nutritious food to the children. We all know how important good nutrition is to the children; that’s why HomeChoice Planners decided to conduct this feeding program. It is to share to the children and their parents what the nutritious foods that they should prepare and eat; also, to share to them insights on why good and right nutrition is essential to our life. We are so glad with the program’s success. The kids and their parents had a really great time. They went home carrying the things that they have learned from the said program. With the great outcome of the activity, HomeChoice Planners is looking forward for yet another program that would be of great help to the welfare of the workers and their respective families. Kudos! Prevention is better than cure. Health is wealth; cliché as these sayings may sound, but it still conveys a cautionary advice for our health. Health is defined as the level of functional or metabolic efficiency of a living being. It’s the general condition of a person’s mind, body and spirit, usually meaning to be free from illness, injury or pain. Thus, being healthy is vital for every human being. It is but right that each one of us wants to have a healthy life. Being healthy is one of our key to success as this would give us the strength and energy to work productively. We are always on the go with our work because our mind and body is in its best condition to think and move. And as concerned citizens of health, our company came up with a program that would be of great help to our workers’ health condition. With the idea and guidance of our company nurse, Ms. Lenny; HomeChoice Planners started to conduct a clinic drive every Monday, where in we check and measure the temperature, blood pressure, height and weight of our workers. 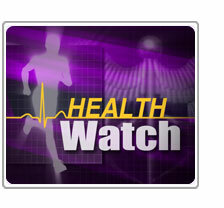 This program is really a big help in monitoring our workers’ health condition. We not only monitor their vital signs but we also give health teachings to them. The company nurse educates them of the safety measures that they should be practicing in order to prevent accidents and other injuries at the construction site. HomeChoice Planners is grateful for the presence of our company nurse as there would now be a health advocate on duty whenever there are emergency situations. Whatever is the workers purpose; be it consultation, vital signs monitoring and wound dressing; our company nurse is present to cater them. Ensuring a good health to our workers is what we aim that’s why we conducted this kind of program. And as what they say, health is wealth; so, for them to be able to have a productive life, being free from illness and injury is a must. Live a Healthy Life!